Greetings from Drogheda on the east coast of Ireland, and the story of my A60 Countryman. I’m Shane Conway, and have been fascinated by Farinas for as long as I can remember. I grew up with a succession of these cars in our family during the 1960s and early 1970s, kicking off with a Mark 5 Oxford (YZA 205), then a Wolseley 16/60 (NZE 784) and ending with an A60 Countryman (JZE 11) which my dad replaced with a Ford Anglia in 1973, followed by a second Anglia, a Hillman Imp, and then two Vauxhall Vivas. Sadly none of these cars survive today. Once I was old enough to want my own set of wheels (even before I had passed my driving test), in 1986 I acquired the first of a dozen vehicles I’ve owned over the years since. First up was a 1967 Leyland Atlantean which I had grandiose plans for restoring until I discovered the lower deck framing to be totally rotten. After that came a 1978 Mark 4 Cortina, a 1979 Fiat 127, two Fiestas (1980 and 1985), a Bedford YRQ (1975), two Nissan Vanettes (1991 and 1993) a 2000 Ford Transit and a 1968 Morris Oxford. A bizarre selection indeed. By 2005 all had been disposed of, only the latter two surviving today. A 2001 Luton bodied Transit became my business vehicle from June 2005, and a year later I acquired a second Farina, this time a 1968 A60 Countryman. To view the car meant flying to Leeds Airport and having a test drive around the area. There were a few small blemishes around the front wings and headlights, but mechanically it sounded and handled fine. So a month later I returned, did the deal and headed west across the Pennines towards North Wales and the Irish ferryport, covering the 170 miles in less than four hours. At one stage the car actually reached a speed of 82 mph……. Farina estates are exceedingly rare in Ireland, in fact for a while I thought this would be the only one. Although I’ve yet to see two of them together, I’ve since found out there are three or four more in other parts of the country. Since getting this car, the bodywork has been attended to, a new dynamo and battery have been fitted, and it has been re-registered. In our “all makes” local classic car club it has been well received and draws lots of admiring looks. Unfortunately the summer of 2007 has been so wet that several displays have been either cancelled or postponed, so it hasn’t been out and about much. On one occasion I thought it would be “fun” to go to the local SuperValu and do the weekly shopping. The tight corners and small parking spaces in their underground car park though encouraged me not to do that again (power steering has spoiled us!!!). On a vintage run in July 2007 I was driving behind a 1981 DeLorean, which was noisy enough to drown out the engine sound of my car. While waiting at junctions behind the DMC I had to rev my car to make sure it hadn’t actually cut out!!! Like “Heartbeat” meets “Back To The Future”!! It can be interesting too to just drive around the streets and notice people’s reactions when they see the Austin. Some of course will remember them from the past, others look in amazement, and there’s a third group who are interested, but try to look completely blasé, almost as if these cars were still commonplace. I also find a spell behind the wheel shows just how far vehicle technology has advanced in the last 40 years, in such things as central locking, power steering, centrally located handbrake, five speed gearbox, in fact all the technological stuff we now take for granted on modern vehicles. Although the oldies were basic in comparison, sometimes I wonder if things have gone too hi-tech? 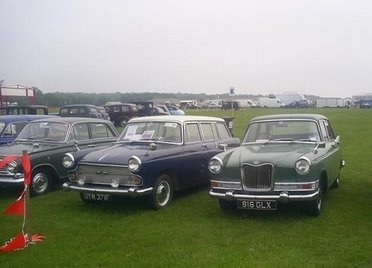 At our local classic show, June 2007, the A60 keeps company with a 1963 Riley 4/Seventy Two.